This unique flavour of syrup stands out from the crowd and is sure to liven up your coffee. This English Nut Toffee flavour is a classic and offers the perfect balance of sweetness and nut. If you want to try something different in your drink rather than our more basic flavours, this is a great one to try. Although it is adventurous, it is still a favourite for many of our customers. Does this Syrup Contain Artificial Colours or Flavours? This delicious DaVinci product contains absolutely no artificial colours or flavours. So, you can enjoy the full, intense flavour with no nasty chemicals. Can I Use English Toffee Nut Syrup in my Latte? Coffee – Add as much as you like to your lattes, cappuccinos, americanos, or whichever coffee of your choice! Tea – This isn’t limited to just coffee, if you like your tea sweet then try adding a splash and enjoy the unique flavours. Ice cubes – A creative way to add some flavour to your drinks in the Summer is to freeze it into ice cubes. 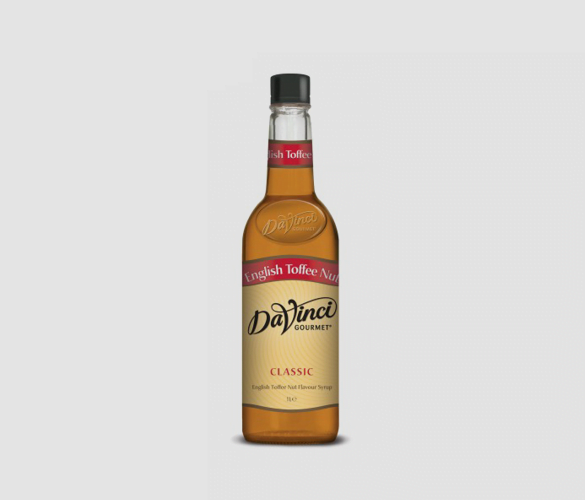 Dessert – This syrup paired with dessert is a heavenly combination. Whether its drizzled on ice cream, added to a milkshake or combined into your cake mixture, it is sure to be delicious! We have picked our favourite way to add it into a dessert below. We have found an amazing recipe from Good Food for a sweet nutty toffee cake. We have tried and tasted (for quality control reasons, obviously) and we have tweaked it slightly to make it even tastier. Preheat your oven to 180°C, butter the sides and base of your cake tin and dust with flour. Put 100g of the mixed nuts into a food processor and whiz for around 2 minutes, or until they are fine. Add the butter and sugar, then whiz again until the mixture is soft and fluffy. Add the eggs one at a time, pulsing to combine. Add the dates and pulse a few more times to combine the mixture. Put the mixture into a large bowl and sift in the flour. Folding in until its combined. Pour the mixture into your cake tin and arrange your nuts in a circle around the edge of your cake, or however you would like. (Although it is recommended to leave the centre free so the it is not weighed down). Bake for around 40 minutes or until golden brown on top. You can check if it is cooked right through by putting a metal skewer through the centre, it is cooked when it comes out clean. Remove from the oven and brush top of the cake with the syrup. Allow to cool for 20 minutes, remove from the tin and then allow to fully cool.